GEORGETOWN, DE – The Crate 602 Sportsman division at Georgetown Speedway often produces some of the most memorable events each race night. In 2019, the division will boast a new title sponsor at the Sussex County half-mile track. Chesapeake Paving & J.W. 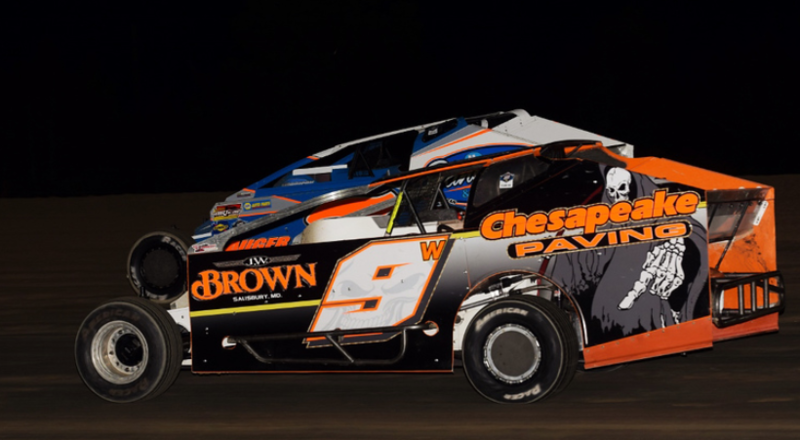 Brown Trucking have teamed up to present the Crate 602 Sportsman division in ’19. The division makes six appearances at Georgetown this season, including three races sanctioned by the Bob Hilbert Sportswear Short Track Super Series (STSS) Fueled By Sunoco. The newly renamed Chesapeake Paving/J.W. Brown Trucking Crate 602 Sportsman division will kick off ’19 as part of the Melvin L. Joseph Memorial on March 16 paying $1,490 to the winner: Round No. 1 of the STSS Crate 602 Sportsman South Region. Other events take place May 17, July 26, Aug. 27 (STSS), Sept. 13 and Nov. 2 (STSS). All Crate 602 Sportsman mains at Georgetown offer at minimum $1,000 to win and $100 to take the green flag, with several paying more. Chesapeake Paving is located at 2445 N. Zion Road Salisbury, Md. 21801 and can be contacted by phone at 410.742.2330. J.W. Brown Trucking is a licensed and bonded freight shipping and trucking company based in Quantico, Md. Contact J.W. Brown Trucking at 410.603.4385. The ’19 Georgetown Speedway season gets the green flag on Saturday, March 9 with Open Practice. The following weekend, March 15-16, launches the Northeast Modified racing season with the Melvin L. Joseph Memorial.